Chrysicthys nigrodigitatus, Distichodus engycephalus and Synodontis schall species were col-lected from Arakanga reservoir, Abeokuta, Ogun State. 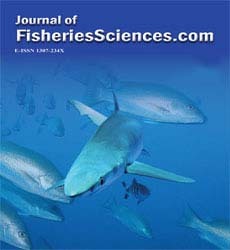 Samples were taken from the buccal cavity, gill and skin of the three fish species using swab stick. The cultural, morphological and biochemical characteristics of the bacterial isolates were carried out. Equally, the sensitivity patterns of the bacterial isolates to different antibiotics such as Gentamicin, Oflaxacin, Spar-floxacin, Ceforoxime, Ciprofloxacin and Caflazidime were determined. The morphometric characteristics revealed that there is no significant difference between the weight of C. nigro-digitatus (77.38 ±7.66g) and S. schall (66.78 ±7.12g) but both were significantly different from D. engycephalus (33.02 ± 2.21) at P˂0.05. The viable bacteria count showed that S. schall had the highest count occurring in the gill (8.32 x 105 cfu/mL). The bacterial count ranged from 1.48 x 105 cfu/mL to 8.16 x 105 cfu/mL in C. nigrodigitatus, 2.5 x 104 cfu/mL to 7.52 x 105 cfu/mL in D. engycephalus and 1.68 x 105 cfu/mL to 8.32 x 105 cfu/mL in S. schall. The bacte-ria isolated include Enterobacter aerogenes, Proteus vulgaris, Micrococcus letus, Streptococ-cus faecium, Klebsiella aerogenes, Escherichia coli, Salmonella spp and Pseudomonas aero-genes. E. aerogenes and M. Letus were most sensitive to Oflaxacin with a diameter of 10.0mm and 8.0mm respectively, P. vulgaris was most sensitive to both Ciprofloxacin and Caflazidime with a diameter of 9.0mm, while others had various degrees of sensitivities. The bacteria iso-lated were of public health importance.